Mojo and his big set of pearly whites brightened the Grade 1 classroom at Glynn A. Green Public School Tuesday. Students smiled and cheered for the big plush monkey as Dr. Andrew Marando welcomed each youngster to the front of the class to properly give Mojo’s chompers a brushing. 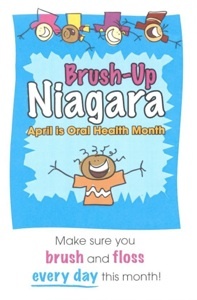 Marando, a Fonthill dentist, has been bringing his smiling friend around to different classes in the area as part of Brush-up Niagara, an annual program designed to promote oral health in children. Click here to read the full article in the Welland Tribune by Maryanne Firth.